Ever since the movie’s trailers have been released, we all have been fascinated with the grand saga of Bajirao Mastani as told by Sanjay Leela Bhansali. Not to forget the countless controversies that keep following up with this royal venture. Anyway, all that apart, we have been quite mesmerized, and at the same time scandalized, by the looks that the lead pair, Deepika and Ranveer, have been sporting at various promotional events for the movie. Love birds in real life, these two are becoming more and more open with their relationship on these events, not that we are complaining. Also, their dressing style is quirky and almost always complementing each other’s attire. Take a look. Both Deepika and Ranveer reached the Red FM Mumbai office color co-ordinated in different shades of blue. At their stylish best, we love the way they both cutely posed for the shutterbugs. Deepika stole our hearts with a tank top from The Tow, and the ASOS White jacket to finish the look. And yes, the assortment of minimalistic jewellery to complement the same, and those killer strappy sandals from ASOS. The duo travelled to Ahemdabad, and met the CM for her good wishes for their movie. They totally rocked the traditional attires, which, by the way was again co-ordinated in shades of white and cream, and awed the audience. 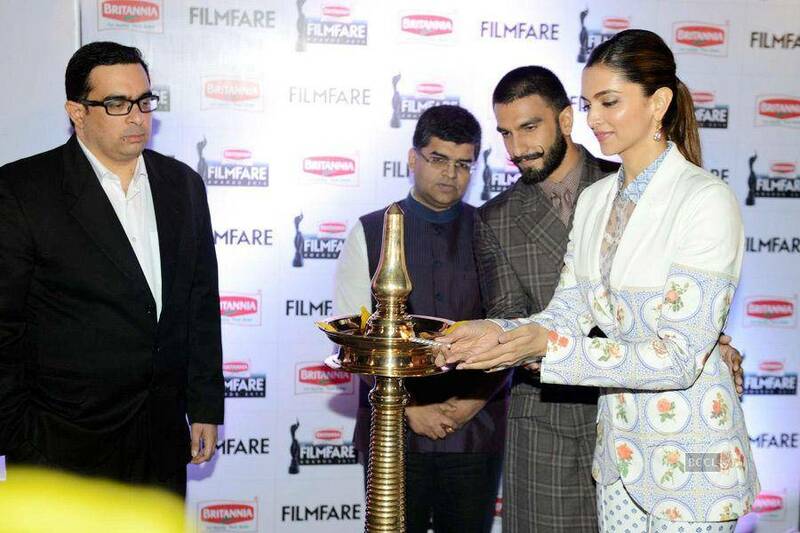 Deepika rocked in the Anamika Khanna outfit, which looked fab the way she paired it with Amrapali cuffs. 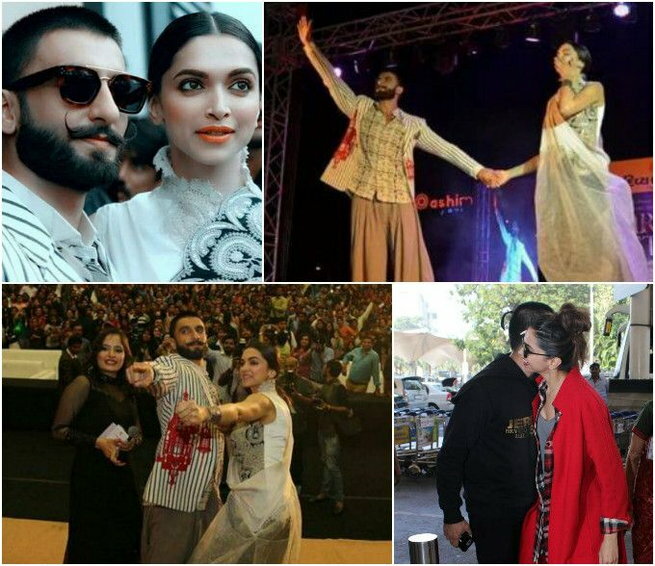 Deepika and Ranveer attended two separate events at Delhi, and the lady rocked them both effervescently. The dimpled beauty sure made heads turn with the confidence with which she sported the formal attire. At the Filmfare Awards press, the leggy lass was seen in a Archana Rao runway look. At another event which she attended the same day, we saw her sporting striped pants, which she paired well with textured Ashish & Soni jacket . 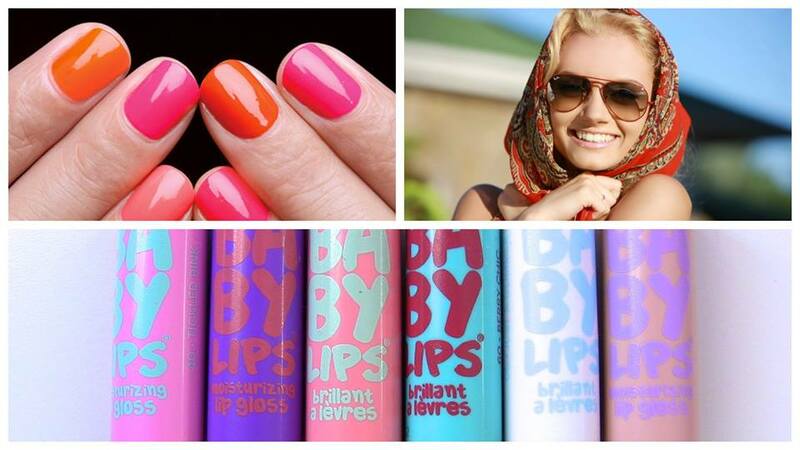 We loved! Dressed in traditionals, with Deepika already swishing our hearts in that gorgeous saree, we really had a melting heart moment, when Ranveer wearing Sabyasachi got down on his knees for his lady love, without any inhibitions. Deepika looked every bit a stunner in the Anju Modi Saree, with earrings from Amrapali to complete the look. Yes, we are sure you would agree too. Take a look at this oh-so-english look these two donned at an event. Don’t they look a stunner? This shoot was done outdoors in natural light, and Dippi just stole our hearts not just with that dimpled smile, but also the coy way she carried the off-shoulder Rutu Neeva dress, giving it a finishing touch with Isharya ring, Bansri earrings, and the gorgeous animal print pumps from Ralph Lauren. There were two promotional events in Amritsar, and the duo of this historical saga look top notch at both. The day event saw Deepika wearing patterned shirt and floral prints skirt from Patine, which was accessorized well with earrings from Ritika Sachdeva, and a Topshop belt. 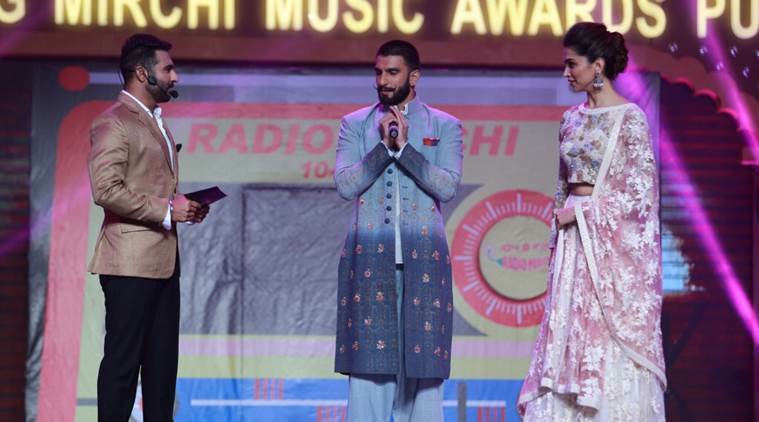 The evening that was lit up by Radio Mirchi awards, we saw our favourite fashionista donning a traditional attire, with a lehenga from Varun Bahl, which was paired with Curio Cottage jhumkis. If you are wondering why we did not give you the style file of Mr.Oh-So-Sassy Singh, the reason is simple. This lad kept himself mostly glued to Anju Modi outfits, and also a few other designers, though the occurrence of that was seldom. Either ways, we loved his looks and ways too, as is apparent from the pictures. Well, be it their love for each other, which by the way is now way too apparent, or their style sense which is always complementing the other half, these two are definitely the most stunning looking couple in B-town in recent times. Next : Wedding Special – 7 Bridal Jewellers to Shop From! !